The two most important nutritional items to give your horse are water and forage -- high-quality pasture grass or hay. Some horses maintain healthy weight on forage without added grain or feed. But many, particular those in rigorous training programs, need more. You can feed traditional unmanufactured grains or choose from nutritionally balanced prepared options in pelleted form. Grains are cereal plants grown, harvested and used for food. They provide carbohydrates for energy, as well as some nutrients. The most common grain for horses is oats. It’s easy to digest, and they like it. Corn and barley are also popular with horses. and they're good options for energy and weight gain. Your horse may not be as enthusiastic about sorghum -- also called milo -- and wheat, so mix them with other grains if you're going to use them. Barley, sorghum and wheat must all be processed; their raw kernels and hulls are too hard for the horse to eat and digest otherwise. You can feed either whole or processed oats to your horse. 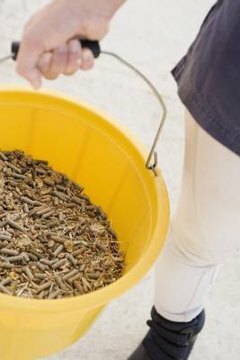 To take the guesswork out of what combination of grains to feed, and in what amounts for optimum nutritional value, horse feed manufacturers have ground up and combined popular grains, and manufactured them into pelleted form. This way you don’t need to worry about whether the grain is processed correctly, and you can read the nutritional information on the bag. You can wet them if your horse has dental issues or if he needs to increase his water intake. A pelleted feed with added molasses is called sweet feed. Extruded feed is just another manufacturing method of the grains other than pelleted. The grains are steamed or cooked, making them easier for horses to digest, so they're popular for senior horse feeds. If your horse eats his food fast, increasing his risk of a condition called choke, the extruded form may force him to chew more slowly. Feed manufactures put other horse foods into pelleted forms. Two popular examples are beet pulp and alfalfa. Pelleted form makes alfalfa easy to store and to add as a supplement to pelleted or extruded feed if your horse needs an additional protein, calcium and energy source. Beet pulp is a low-protein, high-fiber food -- it’s the material that’s left after sugar is extracted from beets. This pulp is dried and sold in either shredded or pelleted form. If you add water and let it soak for a few hours, it becomes a palatable mash. Are Horse Grains Edible for Humans? How Much Sweet Feed Are You Suppose to Give to One Horse? What Is Fodder for Horses?